It’s that time of year: Halloween, when the details of this year’s epic costume are guarded more closely than the combination to the barn wine cabinet (your barn has a wine cabinet too, right?) until we reveal it at our Halloween party extravaganza. Well, unless you’re a horse person. We’ve got enough on our plates, what with hauling hay and feed, mucking stalls, scheduling vet and farrier visits and generally trying to keep our horses from killing themselves on everyday objects. If our own ghoulish appearance after a day of barn chores isn’t good enough, then that’s too bad. The good news is, whether it’s a horse show costume gala or a backyard barn party, horse owners have the makings of great costumes right at their bandaid-covered fingertips. Here are a few ideas for easy-peasy attire for any Halloween haunt. Zombies are all the rage, and if you want minimal work for maximum impact, this is your go-to costume. All you need to do is get up, go to the barn, and do the day’s work. Then go straight to the Halloween party. It’s the one time you don’t need to go home and clean up first. Your soiled clothing is the perfect foundation for classic undead couture. Along with garden-variety dirt, chances are that your horse has also blown something disgusting on you. No special makeup is required since you’ve probably got a bruise and goose-egg on your forehead from miscalculating the distance between your cranium and the saddle rack (again). With a little luck, you’ve further bloodied yourself cutting open a hay bale or smashing your thumb with a hammer while repairing the fence. If your horse stepped on you in the cross-ties and you’re walking with a limp—excellent for characterization. Likewise, dark circles under your eyes from spending half the previous night walking a colicky mare are a bonus. But even if you got plenty of sleep and managed not to wound yourself, you’re still guaranteed to smell like something that just crawled out of the grave. If authenticity is the benchmark of a good costume, you win. This is another effortless costume. Just put on baggy jeans and a long sleeved flannel shirt, and stuff them full of hay. If you don’t like the idea of lashing yourself to a post in the cornfield for the duration of the party, it’s OK to go with the more genial Wizard of Oz portrayal. If you’re sensitive to jokes about not having a brain, this isn’t the costume for you. You should probably stay out of politics, too. On the plus side, not having a brain means the zombies will ignore you. One caveat: Please steer clear of the campfire, unless you want your scarecrow costume to spontaneously morph into The Human Torch. Encase yourself in a large trash bag. Enter the party rolling across the floor. Leap into the every so often and fly across the room as if carried by the wind. Wrap yourself around people’s legs unexpectedly. 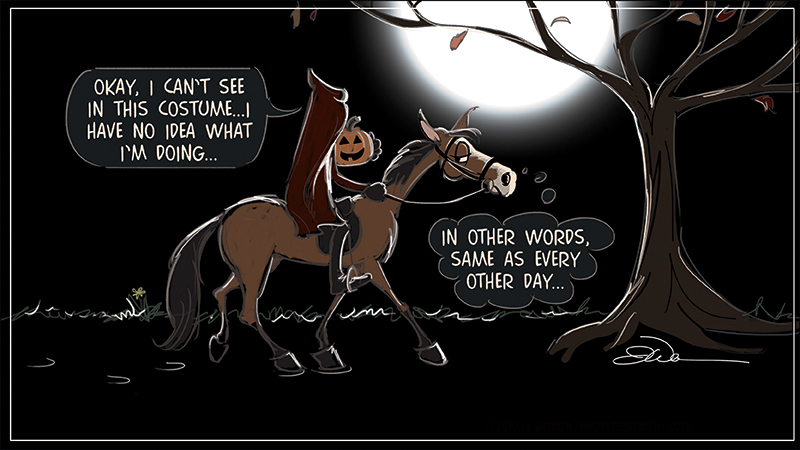 Terrorize your friend who dressed up as Mr. Ed. Do not be surprised when people stuff you with used paper plates and napkins at the end of the night. Look at the positive side: you can get away with enough food scraps to feed yourself for several days. We cannot over-stress the importance of including ample breathing holes in your plastic bag outfit. But if you forget, you’re at least neatly wrapped up for easy disposal. We do not recommend wearing this costume if you are in an area where actual horses are present. It may result in a flash mob of panic-stricken equines stampeding through the backyard buffet. Needless to say, this will make you persona non gratis for future get-togethers. Everybody’s got Vetrap in the barn. Just break open a case and wrap yourself from head to toe. Use any color or many—you can’t go wrong. You might want to make sure you can still properly articulate arms and legs before attempting to get into your car and head for the party. And if you’ve got a small bladder, stay away from the punch bowl or leave an, um, opening to handle the consequences. And for the love of Mike, be careful what position you sit in, because nobody needs to see that. Don’t go too tight with the Vetrap. If you pass out from lack of circulation, people are just going to think that it’s part of the act. By the time anybody realizes you’re not faking, rigor mortis will have set in. The good news: Your pre-packaged self will be pretty much ready to deliver straight to the mausoleum. Note: we do not suggest creating your mummy costume with duct tape, unless you want to go to your next party as a skinless human anatomy chart. OK, so we’re taking some artistic license with this, but everybody knows you shouldn’t run with scissorhands and we’re all about safety. Duct tape some clippers to your hands, run the cords up your sleeves and plug them into a battery pack concealed under your shirt (if you can conceal a 12-pack of brew there, a battery pack should pose no problem). Add a some goth makeup, spike out your hair with a little poultice, and you’re ready to roll. Note: we suggest that you do your makeup and hair BEFORE you duct tape the running clippers to your hands, or you may get unexpected results. Though this costume is more frightening if you’re a horse, you can creep people out almost as easily. All it takes is a pair of generic scrubs (splatter them with red paint, or just wear them next time you have give the barn cat de-wormer) and a few props you can find right in the barn. Elbow-length rubber gloves, a syringe fitted with an 18-gauge needle and a rectal thermometer will keep people looking over their shoulders all evening. As a bonus, you won’t have to worry about eating undercooked meat as long as you’ve got the thermometer handy. While not very original, it’s an easy outfit to pull together for those last-minute invitations. Find an oversized coat, button it over your head with the sleeves flapping freely, and find a horse that will actually let you get on it. For a fun twist, you can cover your eyes completely and let your horse be in charge of steering; something he’s probably been wishing you’d do for a long time. You literally can’t get this one wrong. Just color-block your quadruped with slapdash splashes of colorful paint. Tip: Colors reproduce best on white ponies. Your horse show groom will love seeing what he missed at the costume class when he pulls Waymore Whiterthanyou out of his stall the next morning to prep him for the model class. I can’t tell you how tickled he’ll be. Really. I can’t. Whatever you decide to do, just remember this: It’s worth it to get the candy. Even if that means chasing the kids in your headless horseman outfit until they drop it. After years of trying to fit in with corporate America, Jody Lynne Werner decided to pursue her true passion as a career rather than a hobby. So now, she’s an artist, graphic designer, illustrator, cartoonist, web designer, writer and humorist. You can find her work on her Misfit Designs Cafepress site. Jody is one of the winners of the Chronicle’s first writing competition. Her work also appears in print editions of The Chronicle of the Horse. Read all of Jody’s humor columns for www.coth.com here.